The fertility of soil is not just down to the presence of certain mineral nutrients; the soils ability to support the abundant and healthy growth of plants in perpetuity, relies upon several key factors. 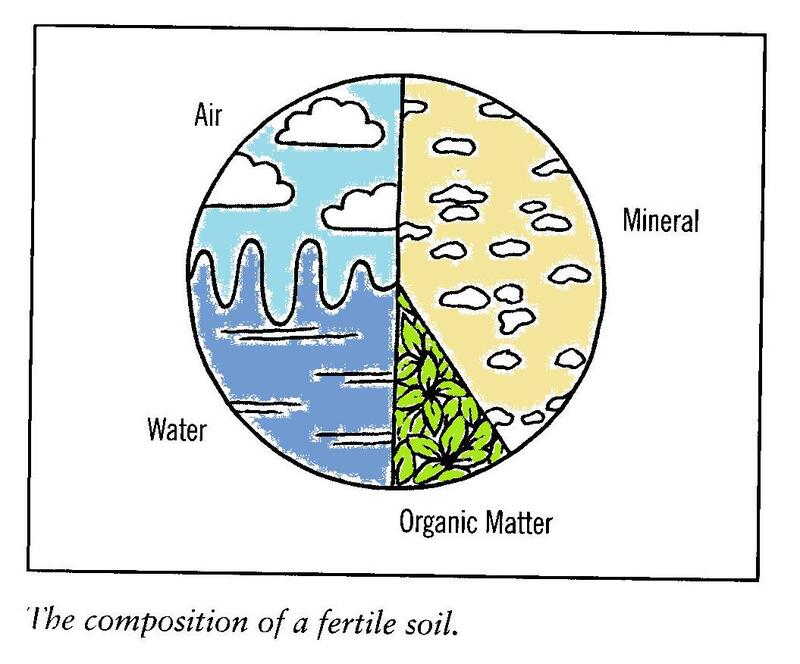 These factors influence one another to form the dynamic functioning ecosystem which is the soil environment. Organic matter is material from dead organisms in varying states of decomposition. It is mostly comprised of dead plant materials, but also includes dead animals and animal waste (poo). Organic matter may make up the smallest part of the pie chart, but it’s effect on the soil is disproportionate. It hugely influences all of the factors listed below. It provides food and habitat for soil organisms of all sizes, from the humble bacterium to the dreaded slug. As it is consumed by organisms it gets more and more broken down into simpler compounds, until it becomes a dark blackish brown substance called humus (no chick peas involved). Humus is a carbon-rich substance which has the ability to hold water and water-soluble nutrients (plant food) in the soil. Humus is vulnerable to oxidisation when exposed to too much air, ie. when ploughed or dug, hence the large release of carbon-dioxide (and loss of soil carbon) caused by ploughing. Organic matter is fibrous and also useful for holding onto the soluble nutrients that plants need, as well as feeding and housing the soil life which create and convert those nutrients, and providing structure. There is a famous statement that tells us there are more micro-organisms in one tea spoon of soil than there are people on the planet. It’s true – many more! 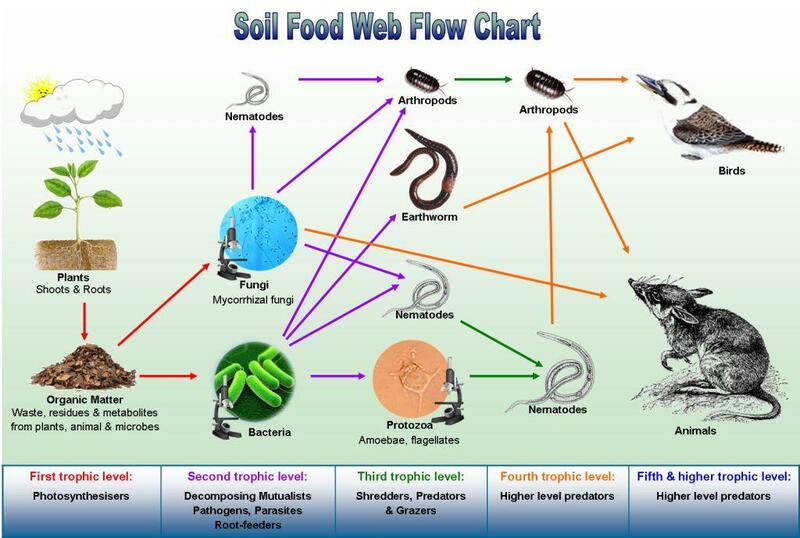 And they all play an important role in what Dr Elaine Ingham calls The Soil Food Web- the soil ecosystem. These organisms are concentrated around the rhizosphere – the area around a plant’s roots, because plant roots form the basis of the food web. Plant roots feed bacteria and fungi with sugars they create via photosynthesis contained in root exudates (sort of sugary sweat exuded from the roots), in exchange for the water-soluble nutrients they need. Most mineral nutrients contained in organic matter and soil minerals are in an inaccessible, non-soluble form which plants can’t absorb. The activity of soil microbes makes these nutrients soluble in various ways, and so there is an interdependency between the plants and the soil life. This web extends to the important creatures working at the soil surface: beetles which shred leaf materials, worms which pull dead leaves into the soil, burrowing creatures which open up pathways for air and water to penetrate the soil…the list goes on. When a healthy and diverse soil culture of soil organisms is absent, plants can only survive if fed with synthetic nutrients. This results in a dependency on fossil fuels, soil erosion, water pollution and low-nutrient crops, as well as a loss of biodiversity and ecosystem resilience. Texture is often confused with Structure, and visa-versa. When we talk about soil texture we are simply talking about the relative proportions of three types of mineral particle: Sand, Silt and Clay. The main difference between sand and silt is the particle size, as that is what defines them, rather than what they are actually made of (they could even be made of the same kind of rock). A particle of sand is visible to the naked eye, we can see it and feel it in the soil. Sometimes it sparkles like glitter, and it gives the soil a grainy feel. Silt is much smaller, and we need a microscope to see an individual particle. Silt gives the soil a floury texture, smooth and pasty, but lacking the stickiness and plasticity of clay. Silt is very moisture retentive like clay, and this can make it hard to differentiate the two at times. Clay is something very different. Rather than being a little solid lump of rock, it is what’s called a hydrated compound. It is a mixture of molecules, including water, joined together by molecular charges. These charges attract other mineral nutrient molecules, which gives clay the very special quality of having its own fertility – it actually ‘holds’ nutrients. Sand and silt don’t do this, which is why clay is often referred to as being naturally fertile. All soils will have some particles of each type, but the proportions will vary, giving different soils different characteristics. For example, clay or silt dominated soils are very moisture retentive, whereas sandy soils are drought-prone. It’s useful to know your soil texture so you can care for it in the right way. When a soil has a fairly balanced mix of all three particle types, we call it a loam. There are subtle nuances in discerning soil texture, but there are many easy DIY tests you can do to get the hang of it. The structure refers to the physical way in which the different components of the soil are joined together. If you think of the structure as a building, the mineral aggregates make up the solid walls and pillars, while the spaces in-between contain air and/or water in varying quantities (hence the wiggly line on the pie chart). These space, known as pore spaces are vital for soil and plant life to thrive. Plant roots need access to both air and water at all times, and soil microbes have evolved to thrive with the right levels of air and water that a healthy structure provides. Many factors contribute to good structure: Organic matter has fibres which hold air and water like a sponge; humus also has a sponge-like quality which both holds water and allows drainage; soil creatures open up channels for air and water by burrowing and leaving behind mucus which helps to bind aggregates together; bacteria produce a slime which holds mineral and organic particles together; plant roots open up the soil structure and create air spaces when they rot- the annual shedding of fine feeder roots which plants do in temperate climates adds huge amounts on carbon to the soil, while maintaining good soil structure. Plants use a huge range of mineral nutrients in the growth and metabolic processes. The agrichemical companies have had great success convincing us that the only things a plant needs are Nitrogen, Phosphorus and Potassium (NPK). These are the nutrients plant use in the largest quantities (in general), and they can certainly grow and survive with these alone, but they will be lacking the trace minerals which give them resilience, pest and disease resistance and nutritional value. Not only that, but chemical fertilisers harm the soil food web, as does ploughing and digging, so with a chemical approach, the soil ecosystem is gradually degraded to the point where it is no longer a fertile growing medium without the addition of fertilisers. As we see from looking at the above factors, all are interconnected – fertility is the result of a living system. The pH reading tells us how acid (pH4 – 6.5), alkaline (pH 7.5 – 10) or neutral (6.5 – 7.5 ) our soil is, and this can affect what we are able to easily grow in it. 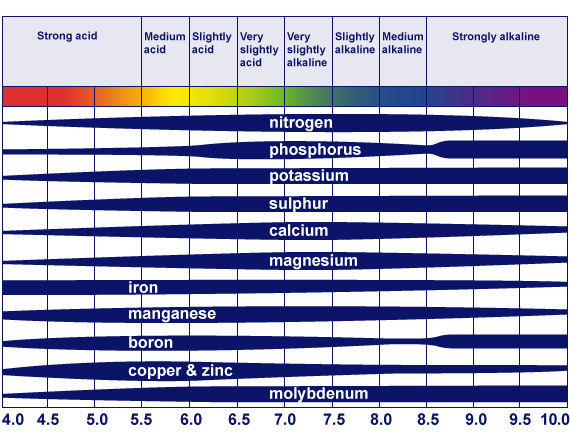 Most people think only of pH when it comes to testing their soil, and are less aware of the factors above. This makes it seem like pH is important than it often is. It’s really only an issue if a) it is very acid or very alkaline; or b) you want to grow something which prefers a pH different to what you have in your soil. The pH can affect which microbes are active in the soil, and different microbes unlock different mineral nutrients, so in affect, the pH affects nutrient availability for your plants. There are amendments that can be made, such as adding lime or calcified seaweed or growing a ley crop of lupins to raise pH, or add ericaceous compost, sequestered iron, pine needles and coniferous bark chipping to lower it. However, by far the easiest approach is to grow the kind of plants which will thrive in the soil you have. By understanding what makes a healthy soil, we can better care for it as gardeners and growers. This basic knowledge forms a foundation upon which to get to know you soil and ‘rewild’ it into the living system it should be. More tips on testing your soil will follow on the PWA blog – watch this space!